Inspirations, a meticulously crafted 3D animation, reveals a universe of wonderful things based on imagery in M.C. 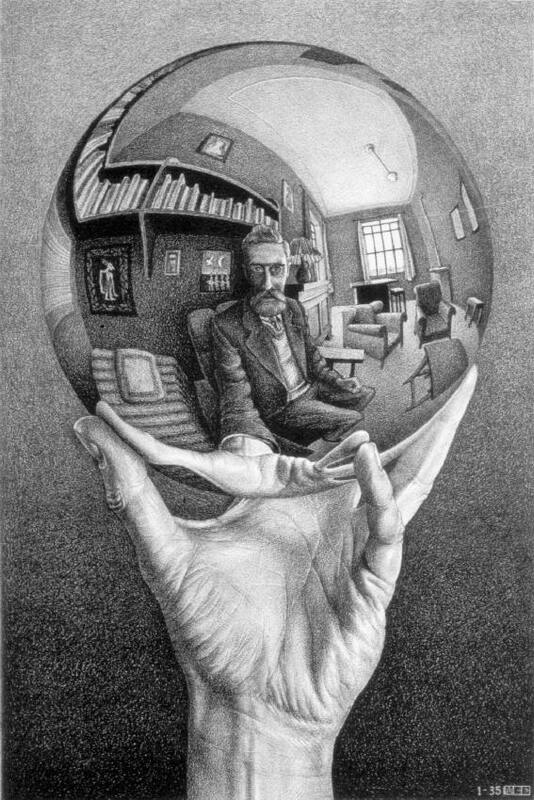 Escher's art. I looked into that enormous and inexhaustible source of inspiration that is Escher and tried to imagine ... what things would surround an artist like him, so deeply interested in science in general and mathematics in particular. This, though, from a completely imaginary, free and invented point of view. The video makes several visual references to Escher's iconic images, and works like a game of I Spy -- find as many as possible in three and a half minutes. It's worth watching full screen in HD to catch details, like a stoic crocodile exhaling a puff of smoke. For a brief glimpse of the artist in his actual studio, visit the official website, and select "M.C. Escher at Work" from the side bar. Unfortunately the video isn't embeddable, but it shows Escher working on a mezzotint. For more inventive videos that add a 3D twist to classic works of art, see "The Work of Art in the Age of Digital Animation," featuring videos inspired by work by Van Gogh, Picasso, Calder, and others. For more work by Cristóbal Vila, visit http://www.etereaestudios.com/.